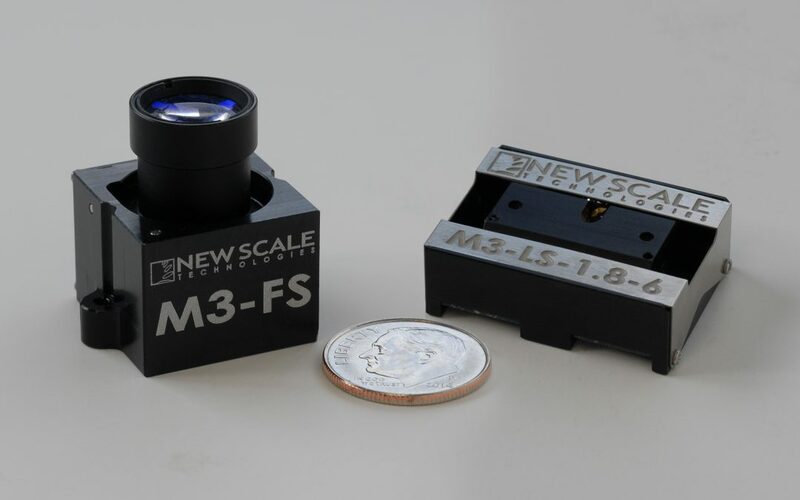 Victor, NY — June 9, 2016 — New Scale Technologies has significantly increased the lifetime specification for its M3-FS Focus Module and M3-LS Linear Smart Stage. The new specification of >10 million random moves within 1.2 km of total distance traveled further boosts the utility of these tiny, all-in-one systems for commercial and industrial OEM product applications. The lifetime specification of >10 million moves is a 10x improvement for the M3-FS Focus Module and a new specification parameter for the M3-LS Linear Smart Stage. It is based on months of performance testing, in which standard M3-FS modules achieved more than 56 million movements of approximately 21 µm each for a total distance moved of 1.2 kilometers, with no performance reduction or sign of failure at teardown. Testing conditions included vertical motion and a 10g load. Actual performance will depend on the application and use case. The M3-FS Focus Module was introduced in 2014 as a higher-performance alternative to the company’s original M3-F Focus Module. It incorporates improvements, such as harder-grade steel in the internal SQUIGGLE motor, that contribute to the longer lifetime. The M3-LS Smart Stage, also introduced in 2014, has the same improved materials and design. New Scale’s M3 Micro-Mechatronic Modules incorporate piezoelectric motors, position sensors, bearings, drive electronics and embedded firmware into miniature housings with precision bearings, slides and other mechanisms. With only 3.3 VDC input and new longer lifetime specification, the modules are ideal for integration into handheld and portable instruments.